Every day through Thanksgiving – Target is offering a coupon to save up to 40% off a different kids item with Target Cartwheel. 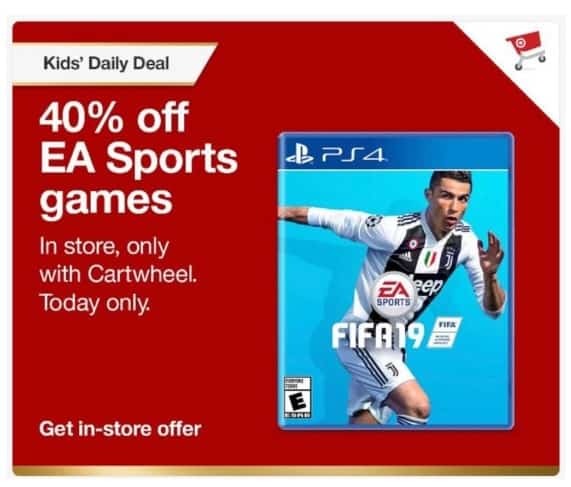 Today’s offer is for 40% Off EA Sports Games at Target and it is valid today only, both in stores and online at Target.com. Plus, you can save another 25% off by texting TOY to 827438. (This offer is available on select toys, sporting goods or kid’s crafts and you can only use it on one item.